Monday - Thursday: 6:00 p.m. - 10 p.m.
Friday 6:00 p.m - 11 p.m & Saturday: 5:30 p.m. - 11 p.m.
Limited Street Parking Available.Valet Parking with validation $16.00 for first 3 hours each additional hour is $4.00. CUT by Wolfgang Puck's original location at Beverly Wilshire, A Four Seasons Hotel consistently ranks as one of the most sought after steak restaurants in the U.S. Offering a contemporary twist on the classic steak restaurant, the menu highlights favorite dishes such as Bone Marrow Flan, Lobster & Crab “Louis” Cocktail and various cuts of the finest beef from regions across the globe, complemented by an extensive international wine list. The best in culinary, architecture and art are on full display at CUT, where Wolfgang’s world famous cuisine is served in a sleek and serenely modern environment, designed by internationally acclaimed architect Richard Meier, and features one-of-a-kind art by celebrated artist John Baldessari and award-winning photographer, Martin Schoeller. Cavatappi Pasta "Mac & Cheese"
Excellent evening! Service was impeccable and the food was outstanding! Fantastic food and wonderful service. We had 630 reservations and left at 930. We had to wait an extremely long time for our food and we had a very antsy 5 year old in our company. Tracey Spillane, was very gracious when we told her of our wait and called the next morning and left a lovely message. Only because of her, will we venture to Spago's in the next month or so. There are so many choices for dinning in LA, if a restaurant is lacking then its just not in our rotation for patronage. We usually go to SUR, Mastro's, Flemmings and Nobu. All of these places treat us like rock stars and we love the food. Thank you for a wonderful experience and great service. Honesty means the most to my family as well as sincere attention. The entire restaurant staff was wonderful and welcoming. 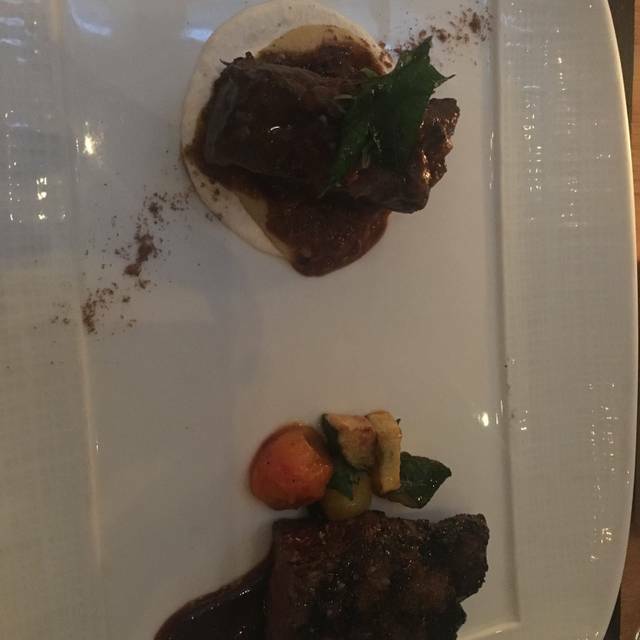 We came specially for the steaks & unfortunately they were extremely charred from the outside, had to remove the layer and eat the inside, the taste was compromised due to the burned flavor, rest of the food was very good. The servers were excellent. The food was really good but obviously very expensive. I’ve definitely had better steak for way less. The bone marrow flan was delicious though. 3 stars for service because we had to wait half an hour for our table Despite having a reservation. Wait staff was very helpful and attentive though. Simply the best food and service in LA. We've been here many times and CUT never fails to please. My wife had the wagyu filet for the first time and it was amazing, with almost equal flavor as the dry age ribeye that I had. Amazing. Service, as usual, was non pareil. I'd write more here but I would simply be repeating myself. Ordered a ribeye in bone. Meat was dry and a little bit over cooked. Not worth the price. Its a good show, wonderful ambience...lots of pretty people...Great waitstaff, sides and salads were wonderful...wine list is mouthwatering...but I was not all that impressed by the chops and steaks. Yes, I know they pride themselves on their meat, but at their price points I was expecting more. This place is expensive, that is a given....but the meat, though good, is not out of this world. Aged this and wagyu that...was it the best ever? I'll head to Harris in SF or Keen's in New York...now that is outstanding! Tremendous experience. I went there for the sole purpose of trying the Japanese Wagyu bone-in ribeye. 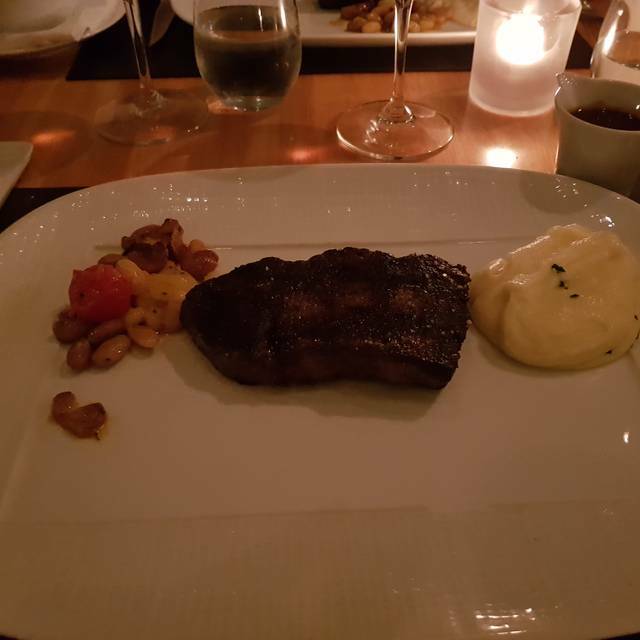 Unfortunately that was unavailable on that evening (my birthday), or at least it wasn't on the menu, so I ordered 6 ounces of what I believe to be the New York Strip. And let me tell you: it was the greatest piece of beef I've ever had in my life. Buttery texture, delicious char, tender meat. All one could ask for in a steak. It came with three different types of mustard on the side, including a yummy grape mustard. 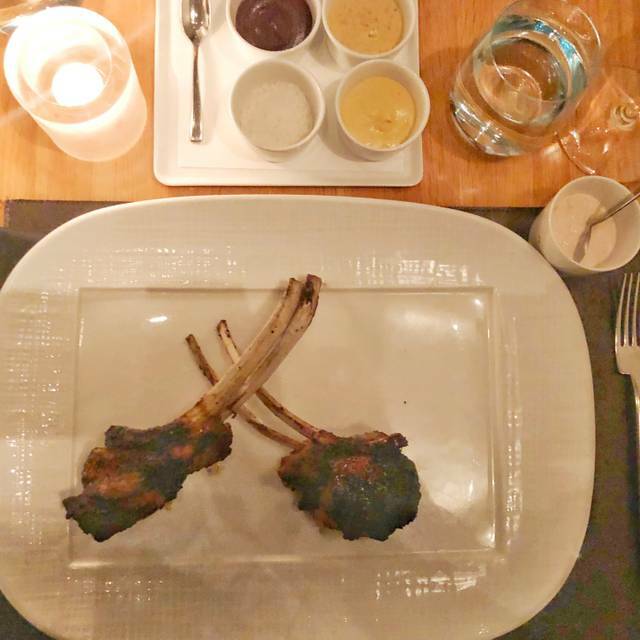 I also had a couple of sauces, the Yuzu Butter and the House Steak Sauce, which were quite good. But to be honest, you didn't really need them, as the steak is the flavorful star of the plate. For a side, I ordered the Yukon Gold potato puree, which was very good. 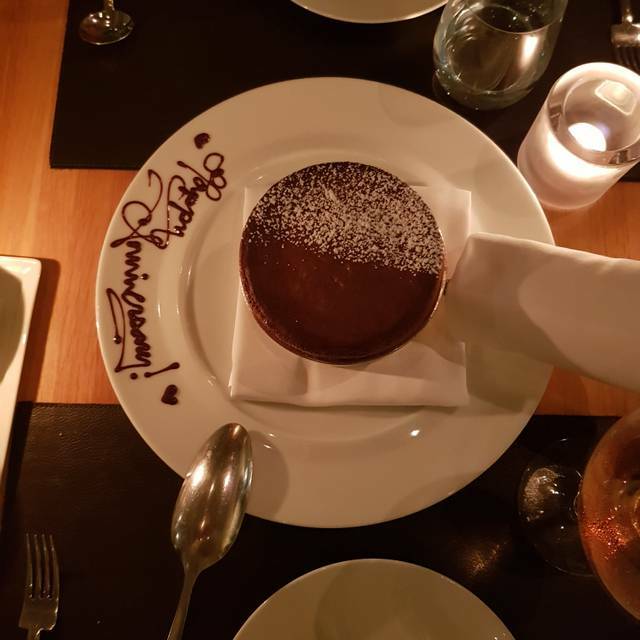 And for dessert, I had the dark chocolate souffle, which was delicious. I also had a cocktail the Bullet to the Head, which was great. All in all, a fine evening of fine dining. If I ever get an agent, I'm going to make them bring me back to there for lunch or dinner. Impressive all around. Our server was amazing - offered an amazing beer and food was fantastic. Great experience. I had the tasting of wagyu medium rare. $140.00 . The meat was good but came burned outside, carbonized , black. Anytime my wife dines with me it’s 5 stars, but that doesn’t mean the restaurant without her is 5 stars! We have dined at CUT Las Vegas, but I happened to be in L.A. for business, which my wife flew into LAX to visit. I must say I was a little disappointed even though I had a great companion! I was especially disappointed after dining at Buffalo Wild Wings, which has a stricter dress code!? Yes, I know it sounds ridiculous. My Wife & I noticed half the customers dining at CUT we’re wearing T-Shirts, jeans, etc. pretty street clothes a little higher end than homeless people. Also, I requested a booth like CUT Las Vegas gives us. Well that didn’t happen. Lionel Richie & his son got one though even though I booked a table a week or 2 in advance. Food was okay. I don’t understand why my Rib-Eye Steak was pre-sliced like I’m a child? Note CUT Las Vegas doesn’t do this. It wasn’t a Tomahawk Steak for two. Now service was great. Our Server brought us out a great bottle of wine (actually affordable too considering I expected to pay more). Wine service at CUT Las Vegas is still more impressive though, but our Beverly Hills Server was still a great guy!! I’m still shocked with the dress code at CUT @ the Beverly Wilshire Hotel though... I wore a suit and knowing my wife was coming to visit & I had made reservations at CUT just for her, Well I went out to buy her an entire wardrobe from head to toe at Michael Kors. I believe it was a few buck$$ more than our CUT visit! LOL .... So, Considering both our Wardrobe cost, high-end rental car, CUT Lounge cocktails and dinner @ CUT restaurant (inside a Four Seasons Hotel not Motel 6) I would say the visit to CUT Beverly Hills cost me $5K. NOW I should had bought us both T-Shirts from Venice Beach to wear, ate at Outback Steakhouse really and left $4.8K in the bank. Incredible meal from start to finish. Knowledgable and professional staff. For the price, there are not only better cuts of steak out there, but the entire ambiance of this restaurant is a total failure. There are too many tables crammed into the space, making what should be a romantic dinner feel more like a lunch cafeteria. The caviar was good (can't really screw that up) although I would prefer to have it with those tasty little canapes instead of the dried toast, and the steak was overall, just OK. We had the grilled carrots, which were delightful, and the Parmesan polenta, which was quite possibly the blandest thing I've ever eaten. The service started off pretty bad... I would have ordered some wine with my steak, had our waiter bothered to come back by the table. That said, when the busser asked if we wanted the polenta boxed up I said, "no thanks, it's terrible" and without another word apparently our server removed it from our bill, so that was a nice gesture. steak came burned for$ 138.00 ,waiter offered to take steak to have burned areas cut of ,WAGYU steak and other side dishes were cold yby the, about 30 minutes later they came w a plate and a slice of vegetables that was already cold.pototes were cold and steak came 30 minute later but was a plain old filet. all sides were hard and cold and I ate mine alone, then my husband ate his alone. Steak over cooked, had the NY Sirlion sampler. Asked for medium rare, was medium+ and the outside charred. Service was decent but not exceptional. It was a great experience. Food was excellent and the staff was outstanding. Only thing that we did-liked was that we couldn’t read the menu that well ( weather it was the low lighting,the small print on the menu or the few to many cocktails we had prior to dinner ;)) but in the end the waiter helped us with our selection brought out 3 cuts of meat and we decided on the 6 oz Japanese cut. Which was delicious. But when we received our check at the end of the meal we were a little star-struck at the price $150 per 6oz steak seamed high to ordinary folks like us. Never the less we paid our tab and left for a watering hole to drink that out of our memory. But in the end it was an awesome experience and we enjoyed ourselves! The special table made old fashioned was spectacular. Bone in Rib Steak, crab and shrimp Louie and beef carpaccio were great. Only complaint is wine list. Very average wines are too expensive. Then you are looking at 250 or more for a good wine. So it pushed us away to just order a glass. We always have a great meal at Cut and our favorite server Jill always makes the meal even more enjoyable !! Expensive+++, however, if you are a beef lover, this is the place to go. Steaks melt in your mouth especially if you go for the Wagyu cuts. The marbling and tenderness, even from the American Wagyu was amazing. Service was outstanding. Never pushy. We felt wanted, especially since we were not staying at the hotel. We were actually thanked for being locals coming in the dine. Wine selection is excellent, though expensive. Sides and Desserts are meant to be shared. 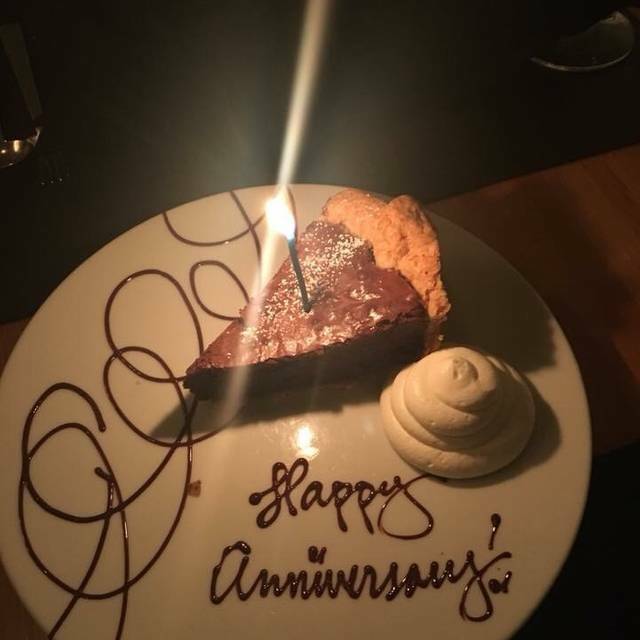 The Baked Alaska was excellent and the chocolate souffle was perfect. Be warned, you do need to reserve several weeks ahead of time, or be prepared to be disappointed. The steak was great however the sides were rather small. The desserts were underwhelming, and the wine was overpriced. The service is impeccable in both the lounge and the restaurant. We are in the lounge for two nights before our “official” dining with friends in Cut proper. There was not one misstep in the quality of the service or the food. The food and service were exceptional. Great wine list, a bit overpriced. The filet, fresh peas and Mac and cheese were to die for! Outstanding overall dining experience! 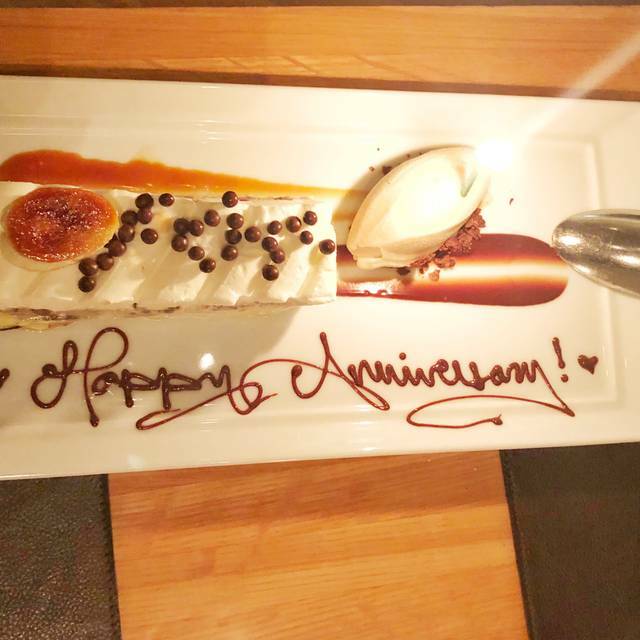 Excellent cuisine and world class service made for a great time. 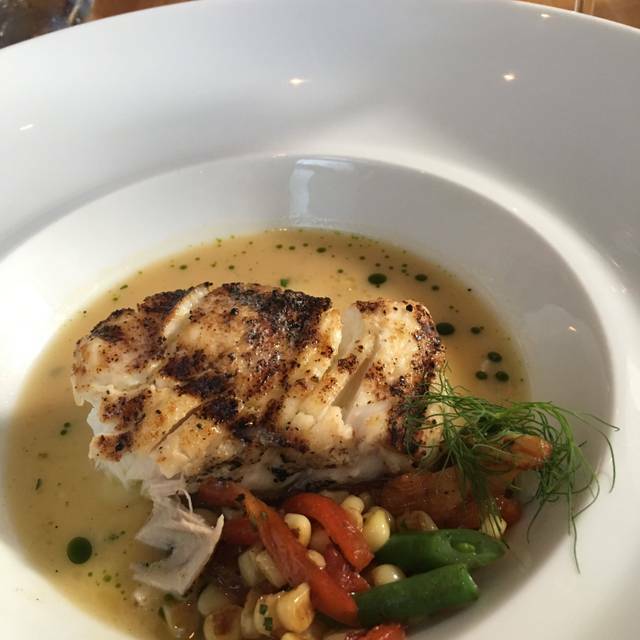 fantastic food and just the right amount of attentive service. I love this place !!!! The best stake outside of Japan!!!! Beyond amazing. Everything was perfect. Wow. Everything about this dining experience was spectacular. There was even a glimpse of Wolfgang Puck himself tonight! If you charge michelin premium, you have to deliver michelin quality. Quite disappointed by the food and service. Bone marrow has lost all its beefy and fatty taste, and the taste was more resemblence of mashed potato. The steak though cooked to a perfect medium rare, was quite dry. Regarding service, starters where tabled prior to our wine was opened. But, you pay for Beverly Hills location. It was high but not delicious. It was very disappointing. Great food, drinks, service and favorite classic rock music played throughout restaurant. My only complaint is that it can take some time between courses. We like our food right after finishing salads etc. Overall, if you can afford the expense, we recommend it, especially family dinner and special occasions. I ordered the meat sampler menu. I ordered before the people seated next to me one of whom also ordered the meat sampler menu. They were served before me. When my food eventually arrived the meat was luke warm. A server eventually came around and asked if everything was OK. I told her no, my meat was cold. She took it back and had it re-heated. It was better when it came back but it should have been served warm the first time. 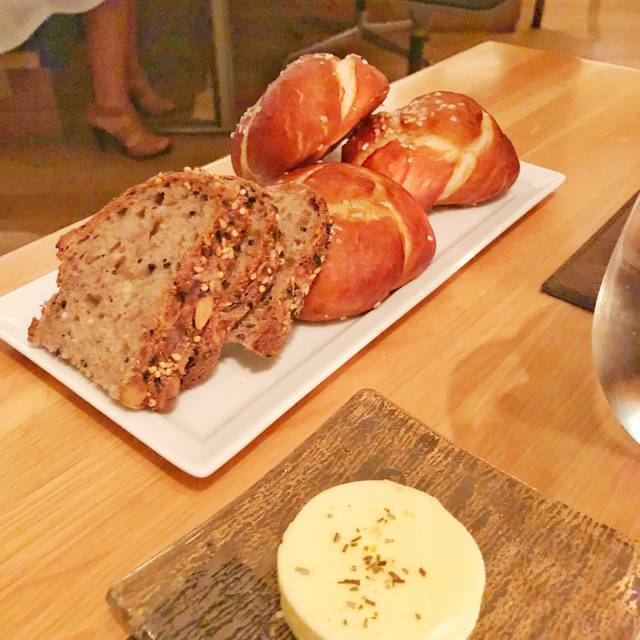 Cut might be the best special occasion restaurant in Los Angeles! 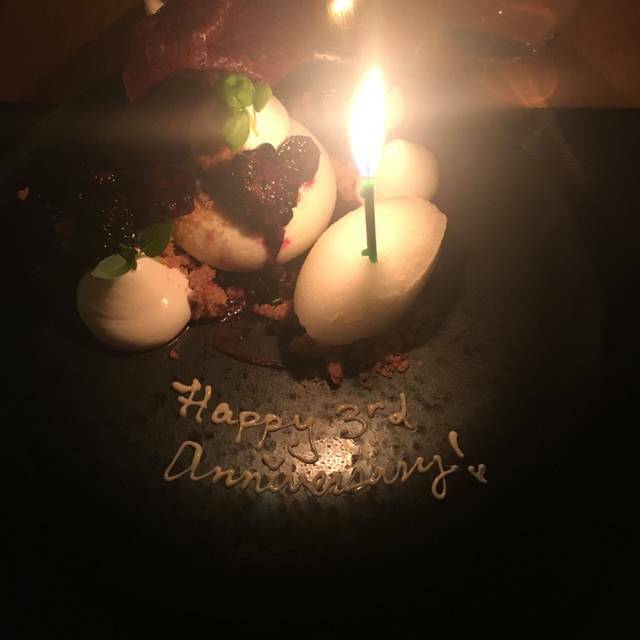 We went for our anniversary, the food was outstanding and the service was impeccable. Our waiter, Paul was extremely attentive, without being overbearing. He made excellent wine recommendations as well. The Bluefin Tuna Toro was perfect and the steak was perfectly cooked! Most importantly, we did not feel as though we were being rushed through dinner, we could take our time and enjoy our special event. We look forward to going back for other special events. The food was splendid, and the service was excellent.